What is My Parent Thinking? What is My Parent Thinking? is a game for four or five parent and teen/pre-teen teams to play at a youth event, birthday celebration or family reunion to foster parent-teenager and parent pre-teenager communication while having fun. Parents will write one word descriptions and the teens/pre-teens will attempt to specify the words the parents have written on the board without seeing the words. Supplies: To prepare for the game you’ll need four to five small whiteboards with markers (or sheets of 8.5 by 11 matte photo paper and markers), colorful bandanas lined with aluminum foil and folded to use as blindfolds for each of the teenagers/pre-teenagers and a digital camera with fresh or fully charged batteries. Select 4 to 5 parent – teen/pre-teen teams. 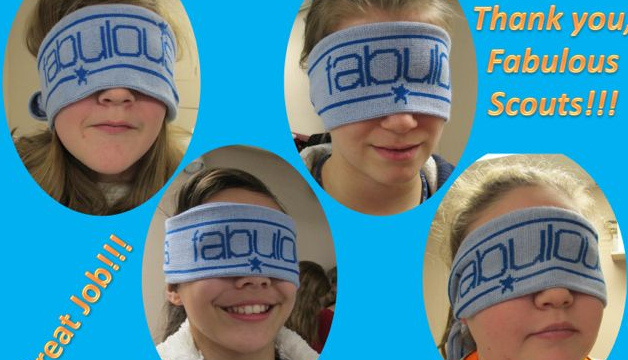 Each parent securely blindfolds their teen/pre-teen (be sure they can’t see out of the bottom of the blindfold). Provide each parent with a white board and marker. The word you would use to describe your teen/pre-teen. The word your teen/pre-teen would want you to use to describe them. The word your teen/pre-teen would use to describe you. The word you would want your teen/pre-teen to use to describe you. 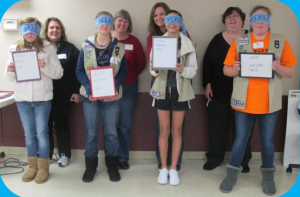 Boards are handed to the securely blindfolded teens/pre-teens. Photograph the teams of teens/pre-teens holding their board in front of them with their parent right behind them. Remind the teens/pre-teens that the first word on the board is the word their parent would use to describe them. Now, ask each teen/pre-teen the word their parent wrote on the board. Keep score, 2 points for an exact match and 1 point for a synonym. Remind the teens/pre-teens that the second word on the board is the word they would want their parent to use to describe them. Now, ask each teen/pre-teen the word their parent wrote on the board. Remember to award, 2 points for an exact match and 1 point for a synonym. Repeat for the third and fourth words. If your experience with this activity is similar to mine, very few people will score more than 1 or 2 points. Some may not score at all. Enjoy the photos and the experience, but perhaps more importantly, use the opportunity to open dialog with your teens and pre-teens. You might also try this activity with siblings, spouses, sorority big and little sisters and other similar groups of people. 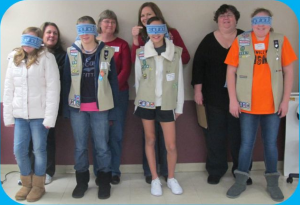 Many thanks are extended to Arlene Harnett, the members of her scout troop and their parents for enthusiastically participating in this activity and consenting for their pictures to be included in articles and website postings. © Ronald G. Shapiro, Ph. D. All rights reserved. For more birthday celebration ideas, visit Dr. Shapiro’s Birthday Suggestions site.